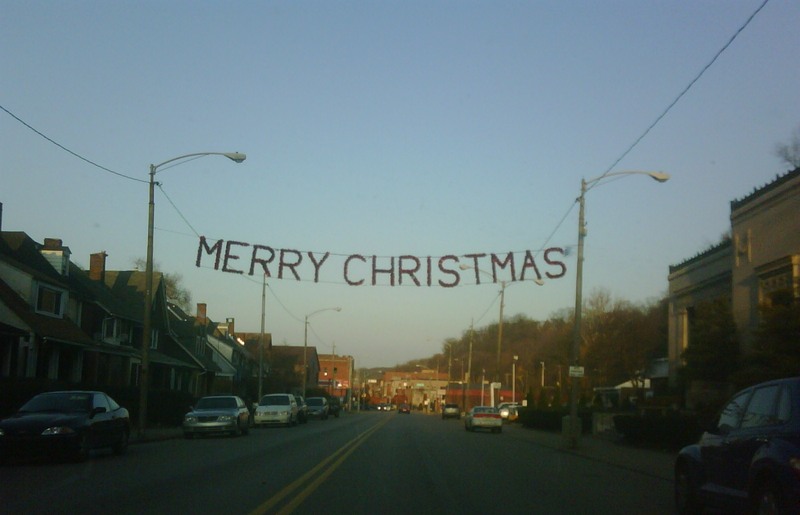 I took this pic while driving down through Aliquippa the other day. I was coming back home from spending a few hours with Ben...the 12 year old boy that I "mentor" there. If you've not been to Aliquippa and you live in the PIttsburgh area, you owe yourself a trip through there. It is such a depressed place in so many ways. When the steel industry pulled out a few decades ago, it's like they pulled out the heart and soul of Aliquippa and its people. But NO! Take a closer look and you'll see heart, and soul. Jesus said that the last shall be first, and in many ways that is living out as truth in Aliquippa. I take heart in a world that is obsesses with "Happy Holidays" and other politically correct crapola that a town in the heart of our region knows where the true hope lies, and is not afraid to display it. He's also very fickle. One minute he is all lovey and stuff and the next minute he's like "leave me alone." One minute he is lying on the floor and the next minute he is fidgeting around on his cushion (his cush-cush!). And I look at him and think...what a nut! And then I realize...over the years, he has taken on my personality!!! I didn't teach him to act this way, he just learned it by watching me! His behavior was caught, not taught. So I wonder...are we watching and catching Jesus? And then I wonder...who (besides Shadrach) is watching and catching Jesus...from ME? Here...let me do that for you! So I went to the Bishop's Day on the District meeting last night. It was a very long meeting, but it was good in some respects. First of all, I got to see some old friends and hang out a bit. I also heard the bishop be very honest about how the United Methodist Church is dying and we better do something about it. I agree. But after a 2 hour and 15 minute presentation, we spent a few moments on our knees in prayer. And part of that time was in explanation of why we need to pray. It just struck me...again...this notion that has been rolling around in my bean for a while now. It seems that we (as Christians) spend much of our time and energy trying to do things only God can do, and then trying to get God to do the things only we can do. Some plant, some water, but it is God who makes it all grow (see 1 Corinthians 3:6). Only God can grow the church. Only He can bring about the Kingdom on earth as it is in heaven. The best effort is to allow that to happen in us individually as we spend our lives on our knees in prayer, devotion, worship, and service to Him. That's our job. 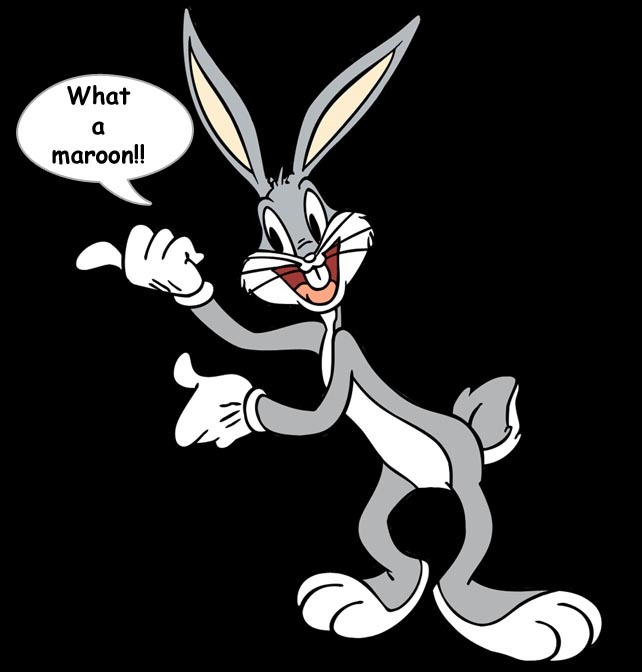 I love Bugs Bunny. He has always made me laugh since I was a little boy and watched him on Saturday morning cartoons ('mimber them?). He had a way of getting himself into some scrapes and then would often, in reflection, say "me and my big mouth!" I guess I have a big mouth sometimes and I get myself in trouble for it. Take for example recently when Carla and I were trying to decide upon a realtor. We met with this woman who was extremely scattered and disorganized. She forgot some paperwork, forgot her pen, and then lost the keys to a home she was showing us! When she emailed to see if we were interested in using her as a realtor, I said no. Now I tried to say it in a polite way, but I guess the truth sometimes hurts. I had a few friends read the email just to make sure I wasn't slamming her and stuff, but I still kinda felt badly speaking my mind. Even if it was the truth. Even if it was in a kind fashion. Even if we, as a buyer, have the right to determine with whom we'll do business and why. So why do I feel badly? I feel like I've opened my big mouth and "hurt" somebody. But in the end, aren't we really called to "speak the truth in love?" (see Ephesians 4:25) And how do we expect to grow if we're not honest with each other? How do we expect to be changed, and to change the world if we're not willing to lovingly confront? - Pork can, and will, explode in the microwave! - Exploded pork can take a long time to clean up! - If you bend down to get something out of the fridge, make sure you back up far enough before standing up or you'll bang your bald head off the freezer door handle, leaving a noticeable divot in your head! - Bald head divots quickly turn to big bumps on your head! - Seeing stars is not just a figure of speech. - Dishrags can, and will, get caught in the disposal! It kinda reminds me how spot-on God was when He said that thing in Genesis 2:18..."It is not good for the man to be alone. I will make a helper suitable for him." Heck, I'm not even dying (at least at a faster-than-normal-than-I'm-aware-of-but-if-I-don't-stop-eating-Krispy-Kream-donuts-that-could-change-rate). I am alive and well. Let me repeat that for the hard of hearing: I AM ALIVE AND WELL! Why do I feel the need to share this news flash? Because of how people are treating me...how they are responding to my news that I'm pursuing God's call on my life to "local" missions. I have people from my previous churches calling and crying because I'm not going to be a pastor anymore. I have people at Cornerstone that avoid talking to me or at least avoid talking about "it", you know, the way it is when you're dying and nobody wants to say you're dying?!?! Well, I'm not dying, and I'm not dead. I'm alive and well and following God's call on my life. I am more excited (read: scared too life) about what God is doing next than I have been in a long time! This is a very good thing. My life as a pastor hasn't been a mistake, it is just that the season has ended. My life isn't over. In fact, my new, new life is just beginning. And this is a good thing! I'm not dead, at least not unless you consider the words of Paul in Galatians 2:20... "I have been crucified with Christ and I no longer live, but Christ lives in me. The life I live in the body, I live by faith in the Son of God, who loved me and gave himself for me." So back in the day, I used to work on a horse farm that had Belgian draft horses. They came and went, but my favorite team we called Bert and Ernie. Bert was an older, gentle, wise gelding, and Ernie was younger, crazier, and personable. When we hooked them together, it was almost unbelievable how they took on each others' best characteristics and covered for each others' weaknesses. I used to love to sit behind them on a wagon or whatever and just watch them work as a team. Stan is my lifting partner at the gym. We usually meet at the gym at 4:45 (a.m....yes it does come around twice a day) and start lifting at 5. We work out for an hour or so then sit and drink coffee and share life. It is a fantastic way to start the day. The bottom line? I need to be a part of a team, or I stumble. Maybe that's why God said in Hebrews 10 that we should not "forsake meeting together as some are in the habit of doing..."
So my wife, Carla, is a nurse. And therefore, she is acutely aware of germs and what they do and stuff. So we have Germ X everywhere...various places in the house, in the car, at the office, etc. And the bottle says right there on the bottom...kills 99.99% of germs. However, from Carla's microbiology class a few years ago, apparently it isn't just the Germ X, or even the soap in handwashing, that does the trick. Apparently, it's the rubbing. No matter how you "sanitize" your hands, you must rub them together vigorously, for that is what really sheds the germs!